A guide for researchers not familiar with latest features of the next generation 3DSuit inertial Motion Capture Systems, released in March 2012.
facilities and Universities as well as the animation community. generation of inertial motion capture systems. This would include new IMU technology (Inertial Measurement Units) as well as a data acquisition pipelines covering some groundbreaking features. 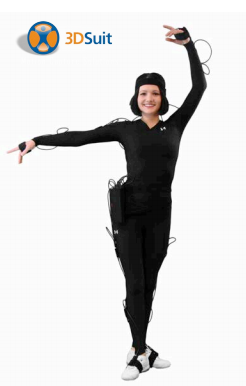 3DSuit system released in March 2012 are the result of this collaboration. This document will explain the 3DSuit systems thoroughly and help identify for the researcher in which exact tasks the Next-Gen 3DSuit systems can be employed where results will be on par with an optical system, and what quantitative tasks should not be delegated to them in the first place. 2.1 Why compare the two systems. Before any motion capture technology was ever commercially introduced, researchers used video cameras and high speed still cameras to capture images in calibrated angles of view and then attempt to line body segments to calculate joint angles. This was (crude and tedious but effective. 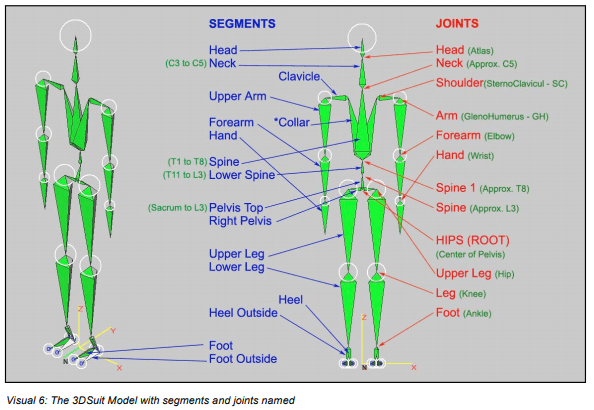 This process of arriving at joint angles from digitizing body segments is ingrained in the biomechanics community’s understanding of how angle data is digitized. From this point of view, any system contending to be a biomechanical tool needs to be compared against the general optical system pipeline of collecting data. When evaluated against optical systems, Gyroscopic system manufacturers have consistently failed to make a positive impression, even though they employ one of the most accurate sensors ever developed. They have not helped their case by offering their systems as a 6 Degrees of Freedom (6DoF) alternative to optical systems since in such a configuration, with large tolerance positional data (either measured or calculated), the inertial systems tend to corrupt the accuracy of their rotational data. The accurate rotational data when left alone can be a valuable tool for a wide selection of research projects. The new 3DSuit systems don’t compete with optical pipelines, but try to complement them. In situations where it is the only candidate, it increases flexibility through its optional user configured (and reconfigurable in post) data file of exact subject segment lengths & orientations. 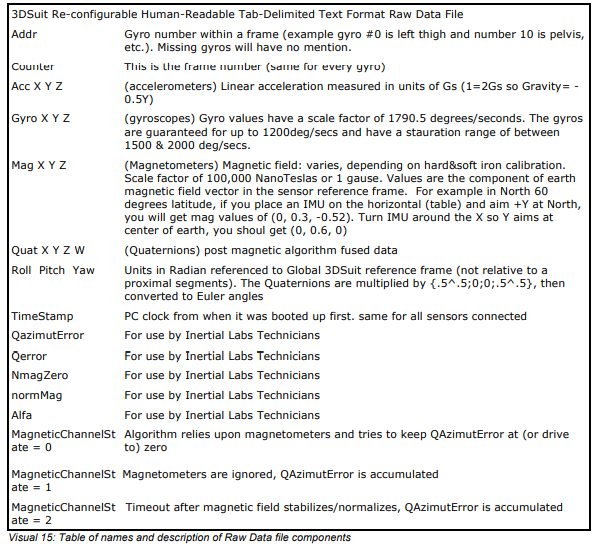 This file also holds reconfigurable magnetic compensation settings for the Raw data – an industry first. Seasoned optical system users have the best tool for capturing data indoors (lab conditions) and have experienced quality data. Those same users can now get similar data on a real bike, in a real car, on a sandy beach, in a kayak, at a house, or running on the grass and this is why we think they would be very interested in adding the 3DSuit system to their research tools. 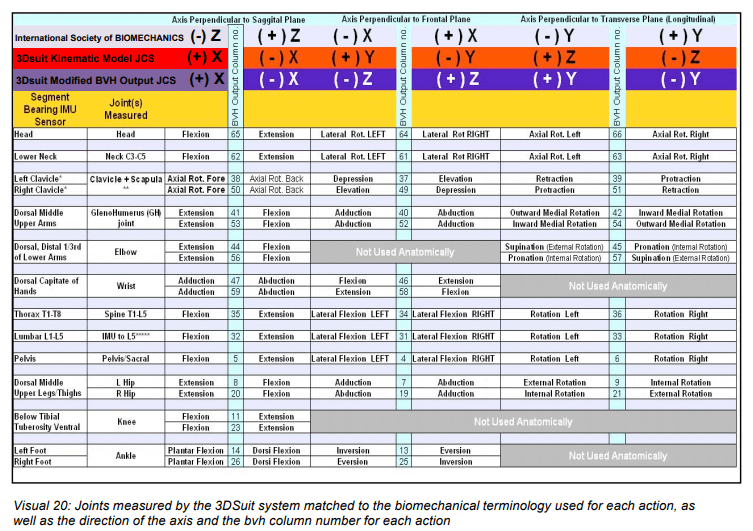 Some general attributes of inertial and optical motion capture systems are tabled below. 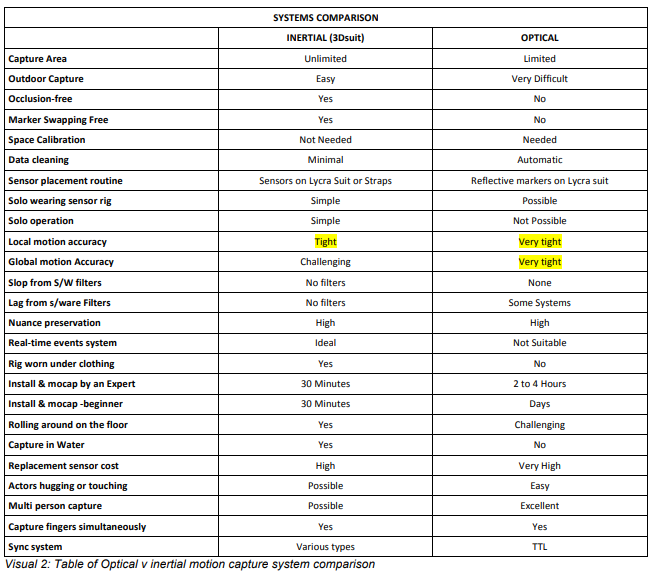 Note that in the following table only high-end optical systems, as well as the Next-Gen 3DSuit systems are considered. Regardless of the type of system used there remain a few challenges which the user needs to learn to mitigate if they want to maximise the accuracy of collected data. 2. Tissue artefact: there are no solid spaces on the thighs and upper arms to place any markers or sensors. Markers/sensors placed on these segments will move when their distal segments move, even if the segment itself has not moved. 3. Skin artefact: sensors need to move with the body to provide accurate data. Sensors moving on loose skin will introduce data artefacts. The size and weight of sensor will reduce this effect, so this is more of a challenge for the inertial system, requiring the IMUs be the lightest and smallest possible size and weight. 4. Kinetic artefact: the momentum of a fist will move sensors/markers beyond their intended travel. This again, is more of a challenge for inertial systems (even though the IMUs are strapped on segments) so size and weight of IMUs are a significant factor in choosing a motion capture system. Both systems are primarily used to collect joint angle data however they go about it in a very different way. Optical systems measure limb position displacement in reference to a user-designated origin, and thereafter calculate the angle of the said limb against the same origin (or another limb). Inertial systems measure limb orientation displacement directly, bypassing the need for segment position data. An inertial system, however, needs an anthropomorphic model at the outset on which to display the motions. The segment lengths of the said model do not alter the accuracy of angles between them (joint positions, however, would be arbitrary). With accurate segment lengths and orientations at the start, either measured manually or photographically, a layer of accuracy would apply to joint positions in addition to already accurate joint angles. Both systems start off with global coordinates, 3DSuit uses Earth’s magnetic field and gravity as reference and cameras designate an origin somewhere in the capture area (hence 3DSuit can have an extremely large capture area). Another difference between the 2 systems is how they display their data. 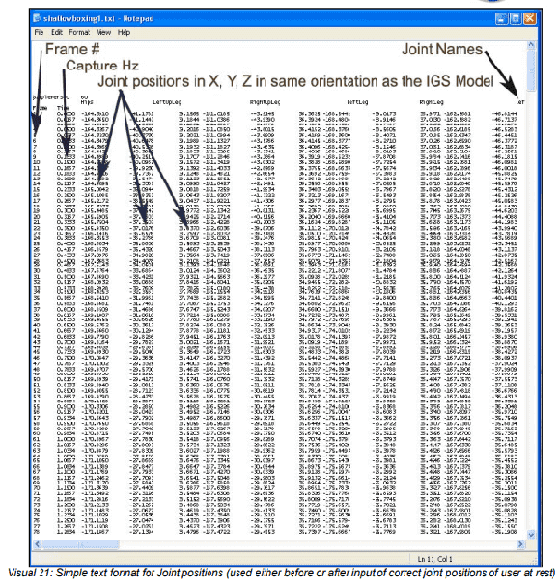 Optical systems, create a representation of the subject in the first few frames of capture which will be an exact graphical display of the collected data, with accurate segment positions. Inertial systems on the other hand need a pre-designated anthropomorphic model in place to assign the collected orientation data to the corresponding segments. The model used by 3DSuit systems is a hierarchical kinematic chain of segments starting at the Pelvis segment (with the root of the hierarchy at its centre and positioned directly above Global coordinate origin). All other joints are linked to the root through 5 clusters of 3 to 5 IMUs (segments) each. The main characteristic of a hierarchical model is that all joints are parented by another joint (except the root which is parented by Global origin). Any angular displacement attributed to a parenting joint will affect the position of its children. 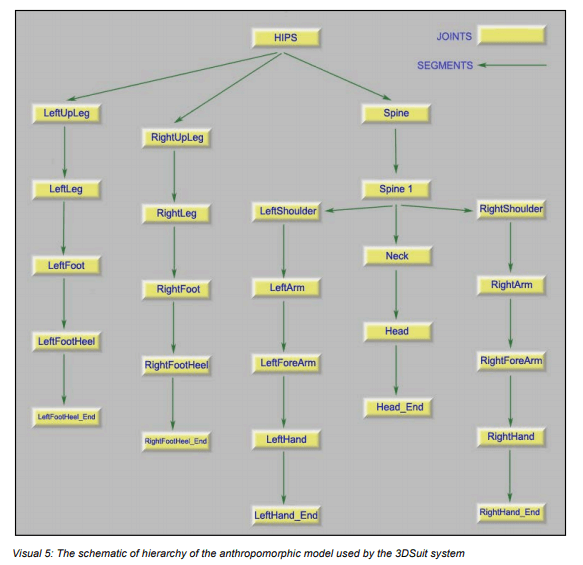 Some inertial systems use statistical anthropomorphic models, which are partially scalable and are matched to the subject’s stance at the start of data stream. This system can’t ensure accurate joint positions, making all joint linear acceleration and displacement data questionable. 3DSuit uses front and side photos of the subject at natural (and repeatable) rest posture while inside a cube with known dimensions and uses a drag-n-drop method of determining the exact joint positions (and segment orientation) of the subject. One of the best ways to take on any job is to understand and take stock of available tools. 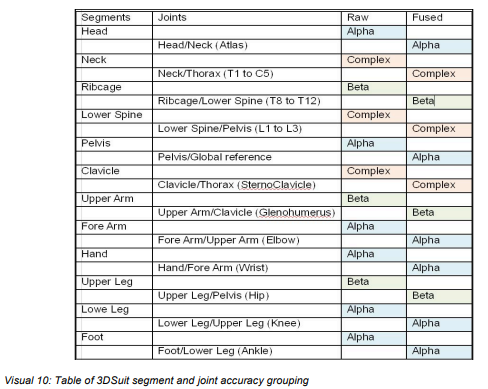 Complex segments and joints are unable to achieve high levels of Raw or Fused data accuracy expectancy since they are generally encompass multiple numbers of bones working together in various axes but are measured using a single sensor which will measure more of the displacement incurred by the bone nearest to it. NOTE: The accuracy attributed to Alpha joints is not impaired even though they usually have other types of segments connecting them to the origin. This is due to the fact that both segments that make up the joint use the same subtraction to the origin and are left only with their own orientation. 2.8 Can Inertial systems provide 6DoF data? 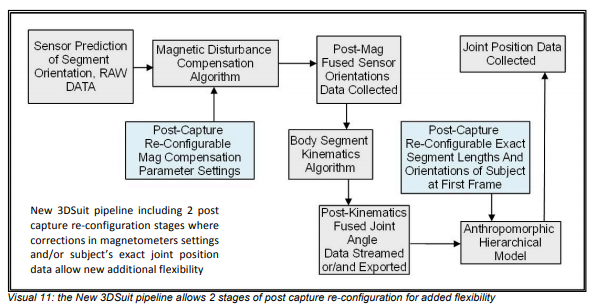 In their push to provide a complete data set (6DoF), inertial system pipelines employ various methods of adding positional information to their collected orientation data but in doing so they trade off their accurate 3DoF data with a not so accurate 6DoF data set. The above features help the researcher to determine if the 3DSuit can be an accurate tool to collect the particular type of data they need. In many instances what they need is provided by the 3DSuit system without going 6DoF and positional information is never used throughout the pipeline. Separation of Main Processing Unit from its battery and wireless units allows users to use the lighter size batteries when lengthy sessions are not intended (largest size battery can last 13 hours and smallest 2 hours). Sometimes wired systems are more apt for some situation. 3.3.1. 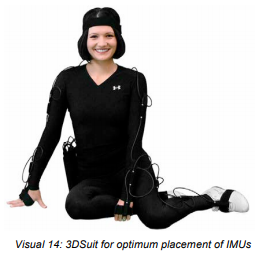 This new feature of the 3DSuit systems will reduce the impact of magnetic disturbance on IMUs. 3DSuit systems as standard will capture 2 sets of synchronised data, one, data fused with magnetic compensation AND kinematics algorithm (to see a representation of the data), and another, data fused only with magnetic compensation algorithm (Raw Data). The new feature is that the Raw Data will have magnetic state of each IMU in every frame, which can be matched to anomalous segment behaviour on the anthropomorphic model in the post kinematics data. 3.3.3. Not only this process can be repeated until satisfied with the results, but can be split for every frame of set of frames, or IMUs in a frame or set of IMUs: as detailed as the magnetic disturbance requires it to be. 3.6 A TTL hardware synch system. We have 19 years of experience in how to design clothing to reduce artefacts in collected data and we have introduced a new 4-way stretch suit in addition to the Basic and the Strap suits. It is designed for special medical or biomechanical cases when disabled subjects need assistance to wear the system. compensation algorithm (first stage fused data). the quaternion and Euler angles within the file. The Fused Data in this file has not only gone through the first stage fusion (magnetic compensation fusion) but also the second stage; the kinematics algorithm fusion. This file, when the data collected is mostly raw, can be used as a reference to see how the various segments are holding up to magnetic interference in the capture space. 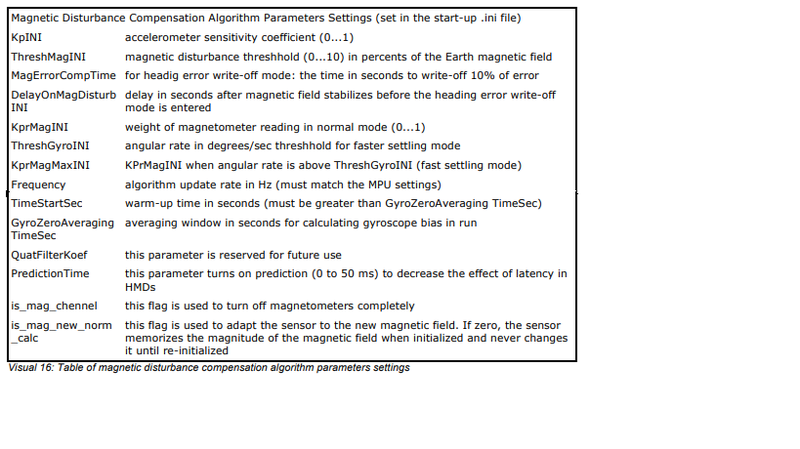 If this data shows magnetic disturbance, the researcher can go back to the Raw data and infuse the ini file with new setting for the magnetic algorithm to try to compensate the disturbance fully. Each time, the result of the re-configuration of the settings can be viewed in the file (after it has been re-computed in the Raw data file). 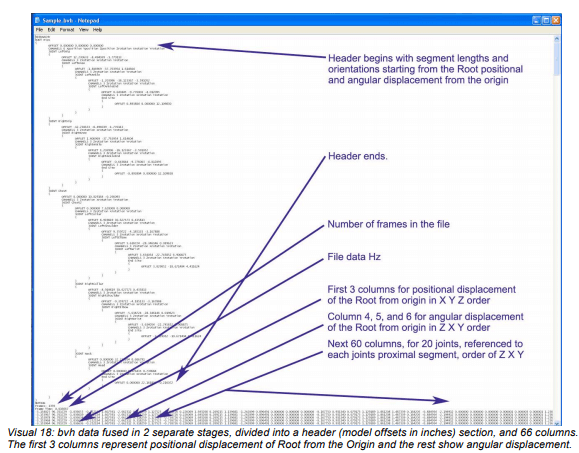 The bvh data (biovision hierarchy model) provides 2 main sections in the output file. The first is the exact offsets for the anthropomorphic model segment lengths (in inches) and orientations by supplying the joint positions. The second section is 66 columns of data. The first 6 are the positional and angular displacement of the centre of pelvis (Root) in reference to the global origin, and the next 60, are the angular displacements of 20 joints, all traced back to the root either directly of through other linked joints. The order of axes in this file for every joint is Z X Y (but XYZ for the first 3 which are positional data). The joint coordinate system on the bvh is Y up (the 3DSuit model JCS turned about the X, 90 degrees plus which makes: 3DSuit model +X = bvh +X, +Y = -Z, +Z = +Y. 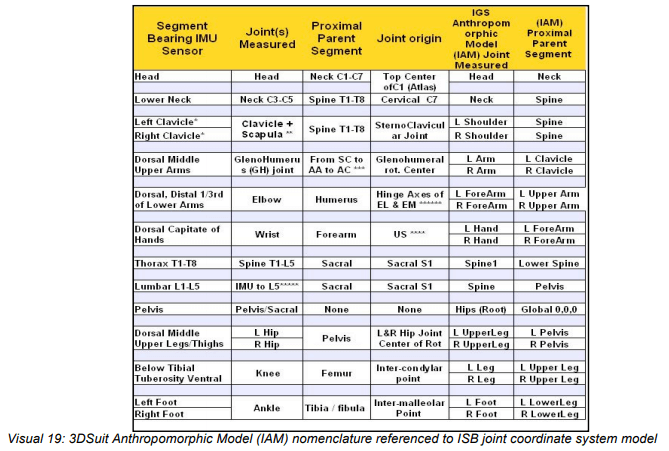 The following table shows the matching of the various joint coordinate systems used as well as the direction of angular displacement in the bvh data matching to biomechanical terminology for the action, as well as the column number of the data in bvh in which each joint action is recorded can be found in the following comprehensive table.